In my continuing quest to find books that illustrate the natural world (i.e. garden and outdoors) for my mosaic kiddos, I picked up "Diary of a Worm" by Doreen Cronin, Pictures by Harry Bliss. What I'm looking for in the books are some good illustrations of layers and levels, like underground, above ground and sky. I'd like the illustration to spark some design ideas for the kids in creating the sketches for the collaborative mosaic we'll be working on. that we'll incorporate into our mosaic. 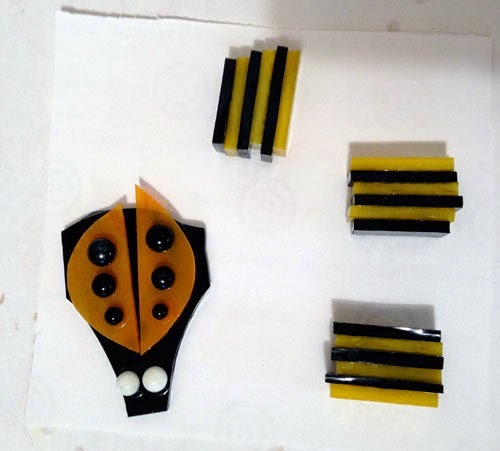 We spent two weeks creating components (some bugs, bees and caterpillars) to incorporate into our mosaic, but now we need to come up with an overall design to begin filling in with glass. The "Diary of a Worm" is a pretty funny book that I think my littles (preK-1st grade) will really laugh at. I got a chuckle out of several of the pages: " Today we made macaroni necklaces in art class. I brought mine home and we ate it for dinner." But, I also appreciated that the author touched a little bit on the purpose of worms: "When we dig tunnels, we help take care of the earth. 'Must make tunnel-help Earth Breathe.'" I also liked the illustrations on several pages that showed a side view of the ground, both above and below. I'd like our collaborative mosaic to have a similar style, showing viewers what's happening below ground, above ground and in the sky at the same time. I also want to get some of the other books by the author: Diary of a Worm: Teacher's Pet, Diary of a Spider and Diary of a Fly. I think my niece (~6) would enjoy these, too, and be able to read them on her own.